Shortly after it was announced that the Huskers would resume their bowl game dominance over the Tennessee Volunteers in Nashville’s Music City Bowl, the bowl’s official Twitter account revealed which team it’s pulling for in a tweet that boasted not one but four exclamation marks. As we all know, this turned out to be a social media boo-boo straight out of 2011. Remember when Chrysler dropped an F-Bomb in a rant about Detroit drivers? The person behind that one was quickly fired. 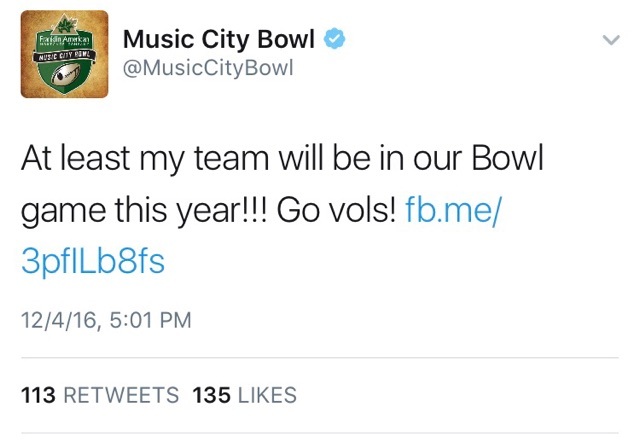 Luckily for the thumbs behind @MusicCityBowl, it sounds like their job is spared based on the candid mea culpa that quickly followed. But let’s go back to the errant tweet for a closer look. Aside from the fact that there are “social media professionals” who are as bad at using Twitter as your grandma, the tweet itself contains quite the loaded statement. “At least my team will be in our Bowl game this year!!! go vols! If that doesn’t scream college-football-fan-who-had-his-or-her-season-wrecked then I don’t know what does. Let’s breakdown the hell the Volunteers have put their fans through this season. After a 5-0 start that featured back-to-back wins over #19 Florida (a 28 point 4th quarter comeback that cost me a five team parlay) and #25 Georgia (a 20 point 4th quarter comeback that ended with a ridiculous Hail Mary) the wheels completely fell off Tennessee’s wagon. Over the next three Saturdays, the Volunteers tumbled from #9 all the way out of the top 25. Tennessee picked themselves up off the mat and crawled back into the top 25 thanks to a nice little win streak with victories over SEC softies Kentucky and Mizzou and pulled out a 55-0 squeaker against FCS juggernaut Tennessee Tech. Then came their season finale against Vanderbilt. The Commodores sailed away with a 45-34 upset victory, just their sixth win over the Volunteers since 1965. And they play each other every year. There’s not even a way to put a loss like that into context for the Huskers. If you combined the historical ineptitude of Kansas with our growing hatred for Iowa, you’d only be scratching the surface of what the Tennessee – Vanderbilt rivalry is like. It certainly doesn’t help that Vandy has won three out of the last five games either. If you go to the Music City Bowl and someone asks if they can take your picture for the Twitter, offer them a hug. There’s a good chance their team has put them through much, much worse than how the Huskers have tortured us this season.